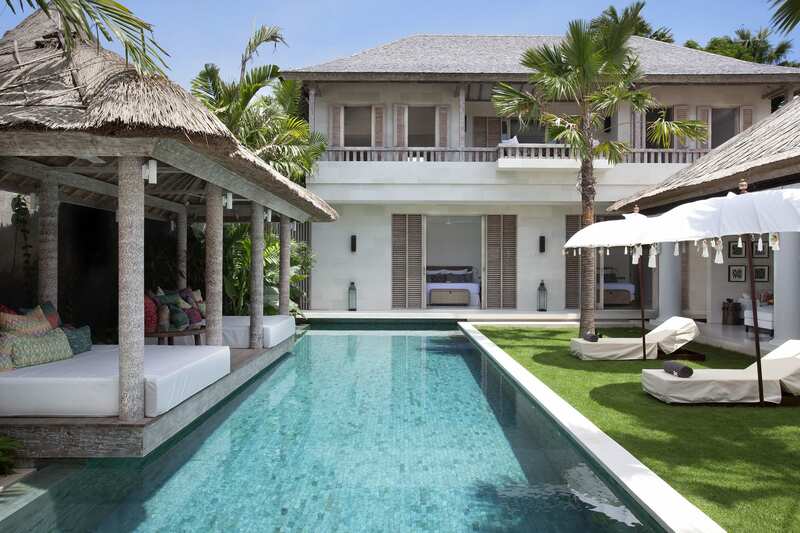 Set smack dab in the middle of all the Seminyak action, Villa Lilibel is a stylish and surprisingly serene space featuring 6 bright bedrooms, a glittering pool, indoor and outdoor living and dining areas and a contemporary colour scheme that is fresh and cheerful. 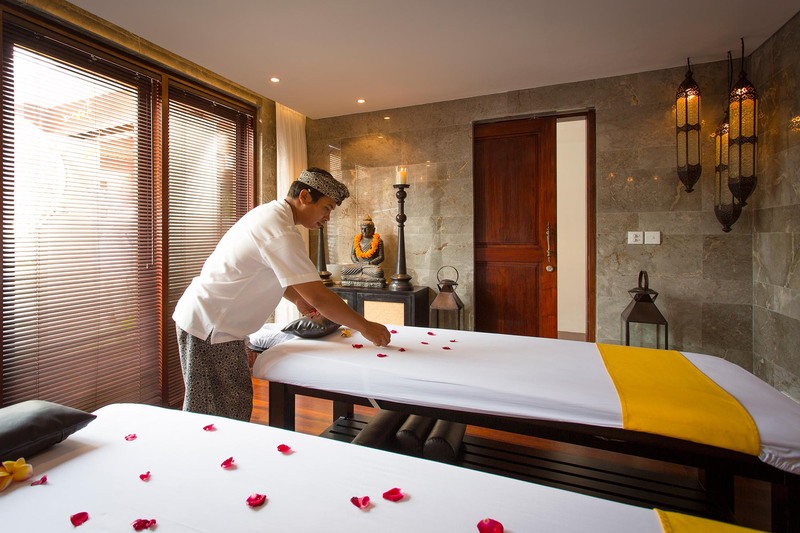 Throw in extras like a fully equipped gym, deluxe spa room and five-star service from the dedicated staff, and you have the ideal spot for a getaway with friends, a family holiday or a group retreat. 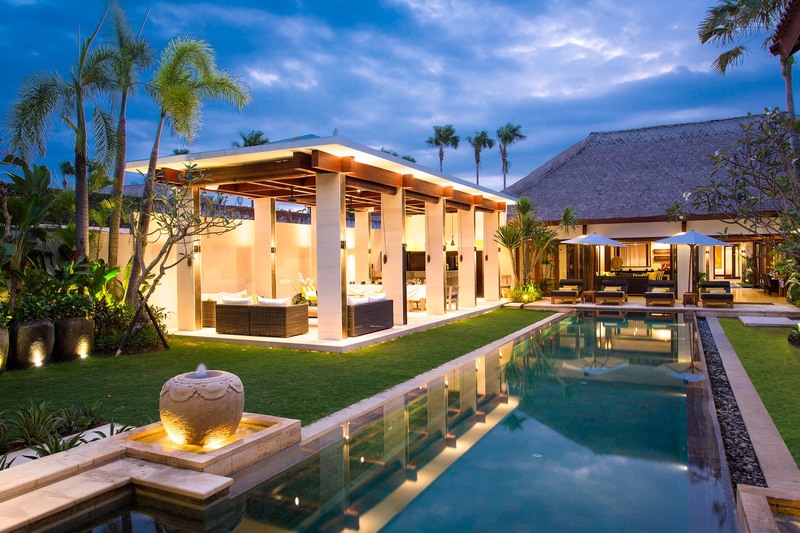 You enter Villa Lilibel through a garden courtyard that leads to a series of single and double-storey pavilions, each with large glass windows, verandas and patios overlooking the beautiful gardens surrounding the swimming pool. 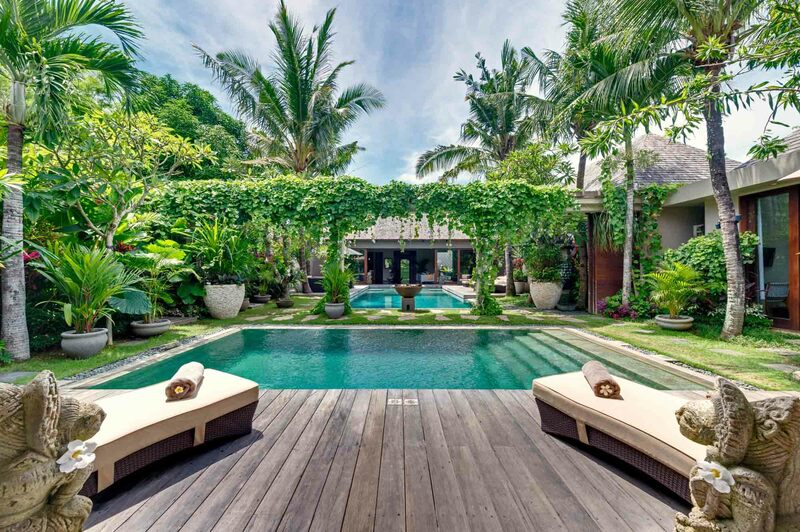 Everywhere you look inside and out there are comfortable sofas, daybeds and loungers, long wooden tables, and lush greenery. 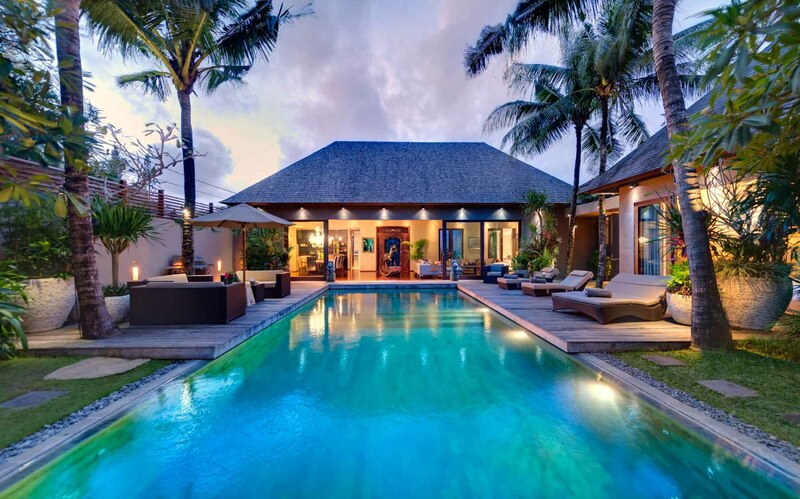 It would be easy to surrender to the laid back vibes here and spend all of your time at the villa, but you also have the beach, stellar shops, enticing restaurants and lively nightclubs right at your doorstep. 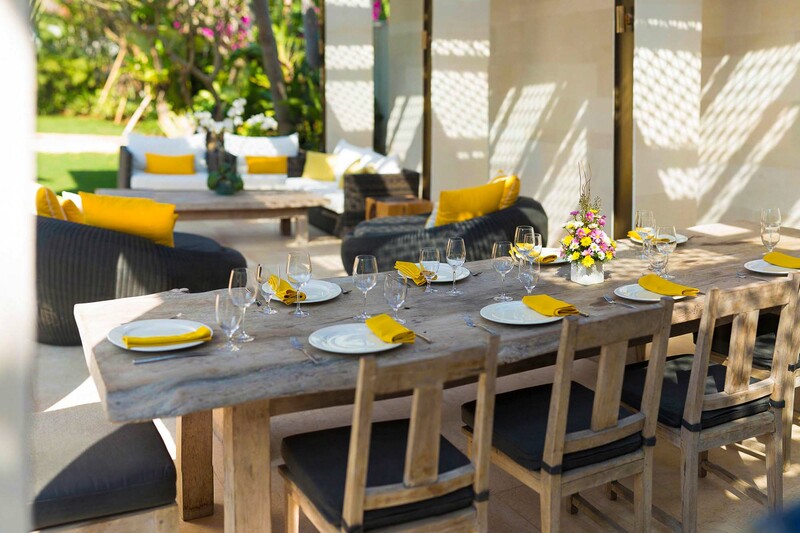 The living and dining pavilion at Villa Lilibel has soaring thatched ceilings with hanging fans to cool the space, muted grey sofas with soft striped cushions, a 65-inch TV, iPod dock, Bose speakers, and a huge wooden table for 12 made out of a single tree trunk. 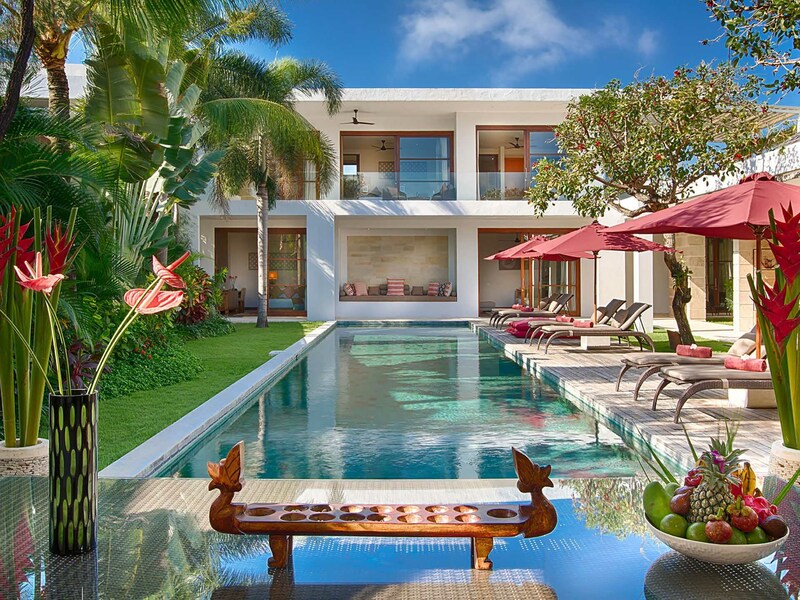 This room also has sliding glass doors that lead out to the pool and the garden. 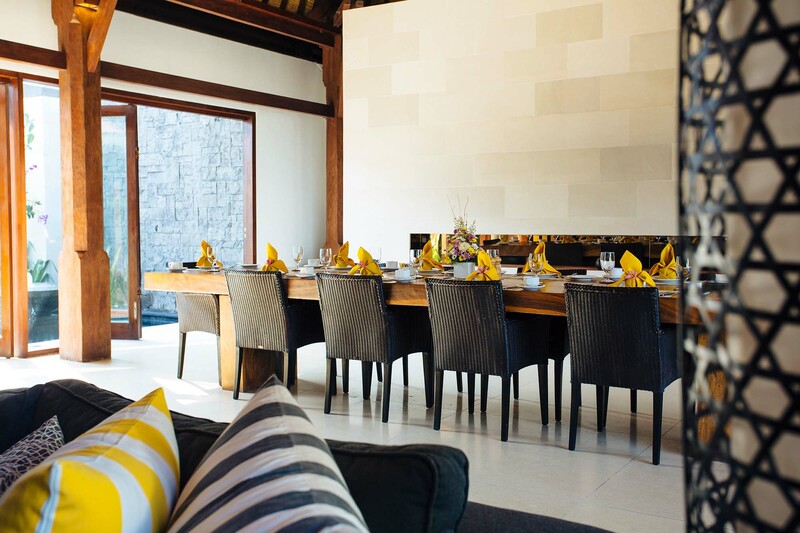 Separated from the living and dining area by a stone wall is the fully equipped kitchen with a marble island counter and a wine fridge. 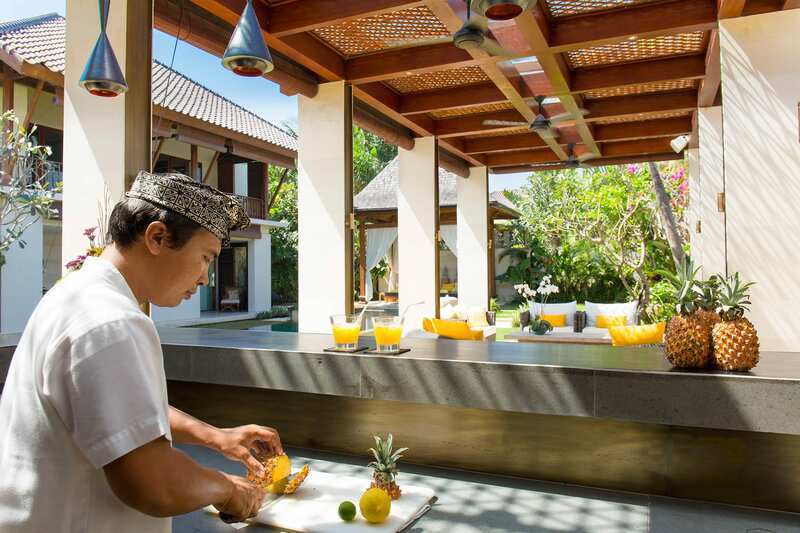 Guests are welcome to cook their own meals here, or you can let your personal chef prepare you gourmet meals based on your unique tastes. 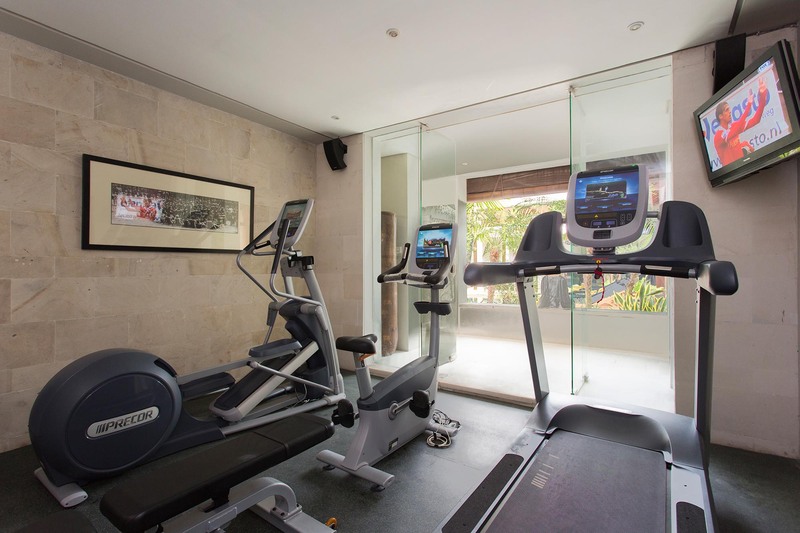 Next to the kitchen you will find the gym with its state-of-the-art weights and machines, TV, mini-fridge and windows that overlook the garden. There is also a media room on the other side of the living and dining pavilion that has a 53-inch TV, DVD player, PlayStation 4, comfortable couches, and sliding glass doors that open to the entrance courtyard. 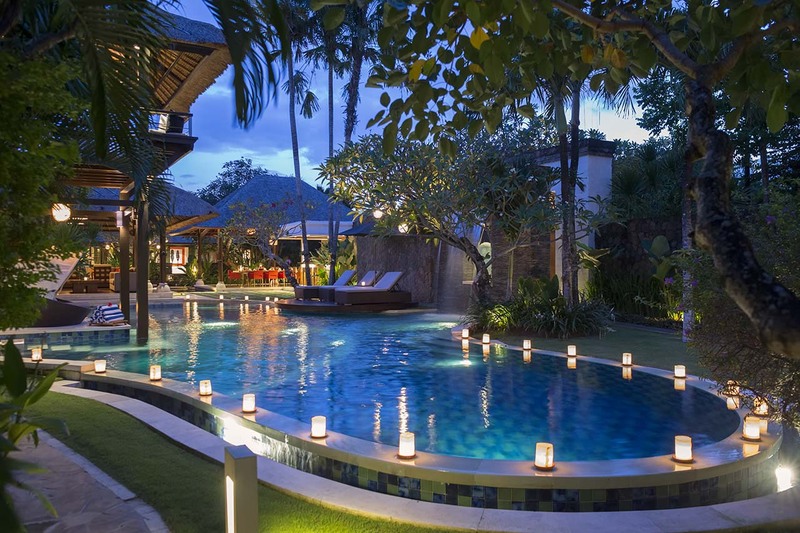 The master bedroom at Villa Lilibel is located on the ground floor of a pavilion fronting the pool, and it features a 4-poster king bed, glass doors that lead to a tranquil courtyard with Buddha statues, and an ensuite bathroom with a walk-in dressing room, freestanding bathtub, rain shower and chandelier. 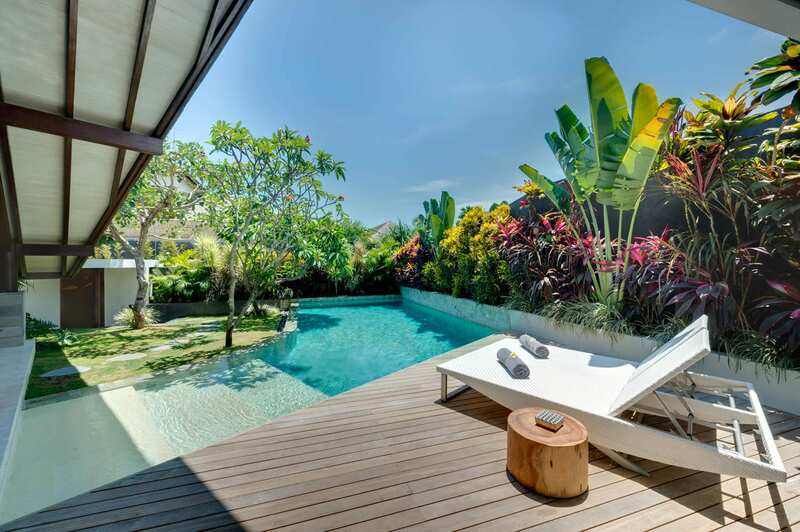 Follow a wooden staircase above the master bedroom, and you reach two guest bedrooms with king beds, ensuite bathrooms with terrazzo floors, rain showers and tubs, and a shared wooden veranda with a daybed, table and chairs. 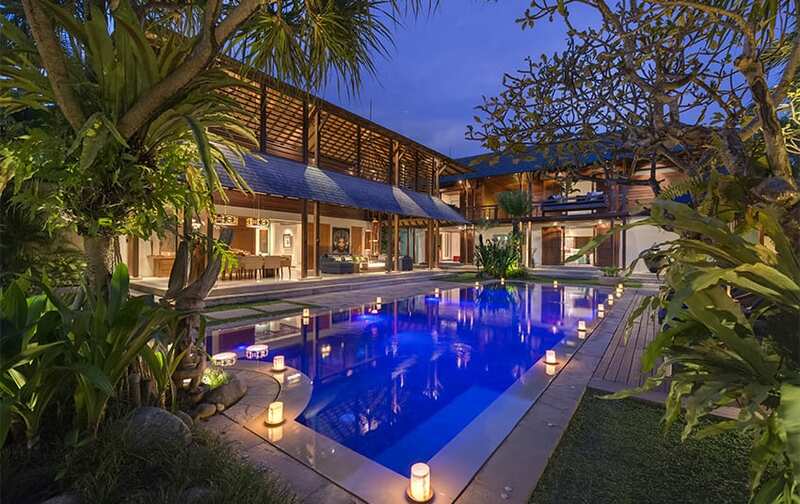 In a separate pavilion set back from the main villa complex are the remaining three bedrooms. The two bedrooms on the ground floor can be set up with twin or king beds, and they have marble bathrooms with walk-in rain showers. The upper floor bedroom features a king bed and sliding doors that open to an ensuite bathroom with a terrazzo tub and rain shower. 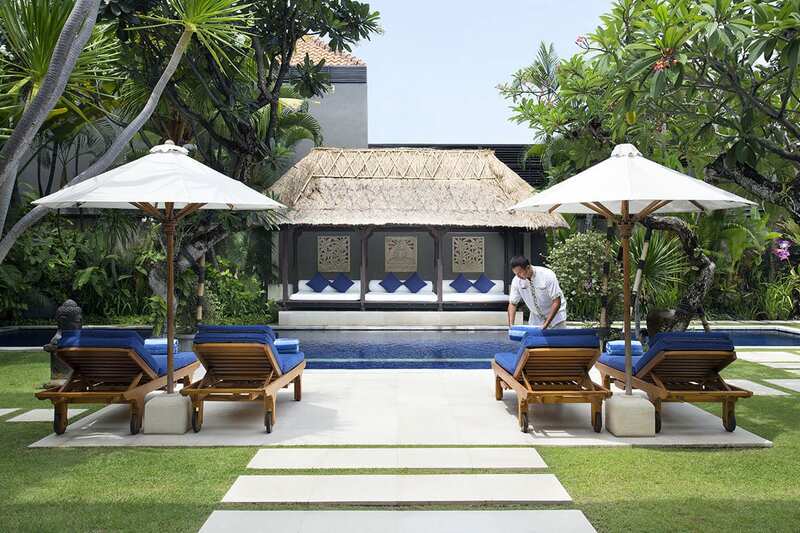 Next to this pavilion, you will also find the dedicated spa room with two massage beds and a private shower room. 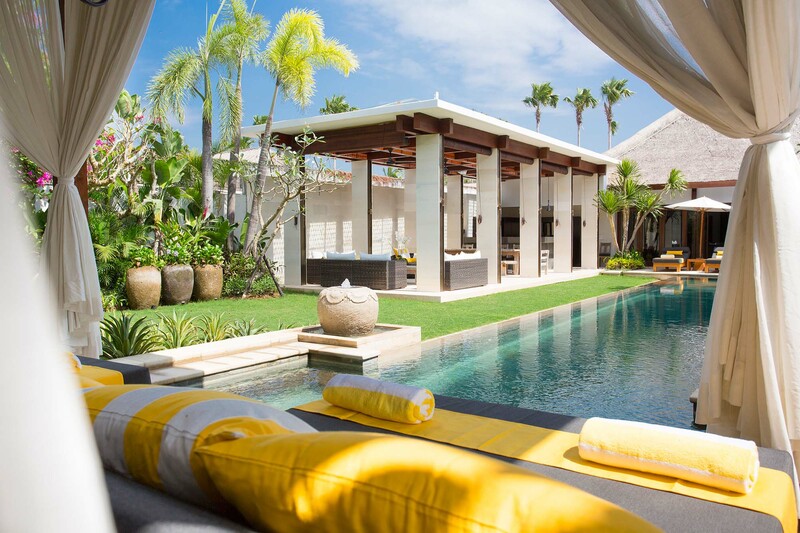 Besides sleek interiors, Villa Lilibel also offers plenty of places to soak up the sun and fresh air. 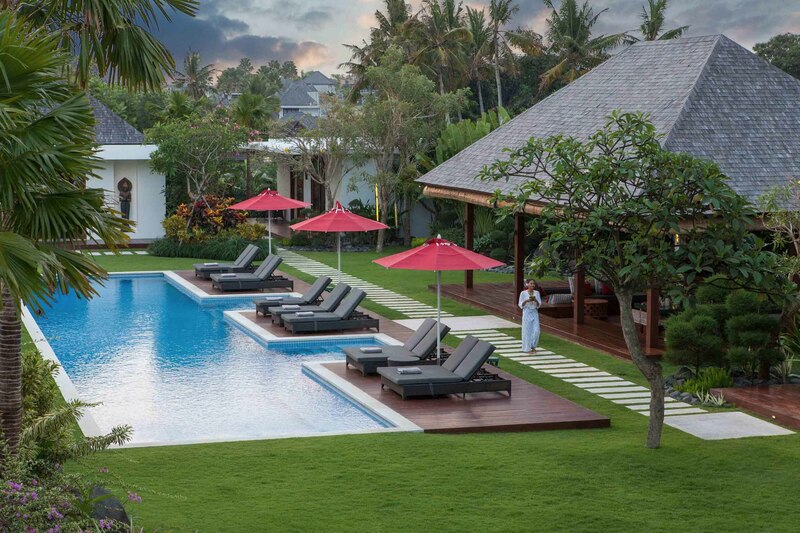 The 16-metre pool has a shallow wading area and built in seats for little ones, and the pool deck offers comfortable sun loungers shaded by white umbrellas. 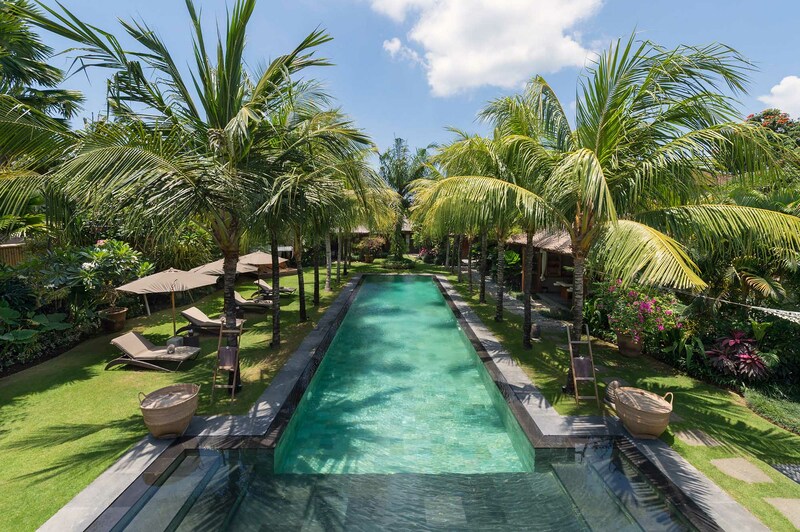 At one end of the pool there is a romantic antique joglo draped in white curtains, and at the other end an outdoor lounge and dining area with sofas, a table for 12, round daybeds, and a barbecue terrace. CAPACITY 12 people (6 ensuite bedrooms with king-size or twin beds). Extra bed are available for an additional charge. LIVING AREAS Indoor living/dining room media room, garden pavilion and covered outdoor lounge area and bar. 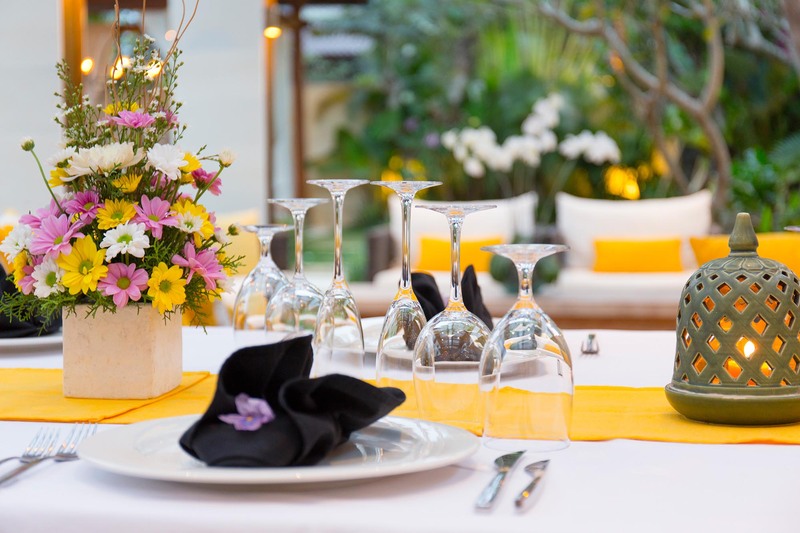 STAFF Villa manager, assistant manager, private chef and cook, butlers, night security. Additional staff (babysitters, masseuses) available on request for a small additional charge. DINING A la carte menu includes Western, Asian, vegetarian and children’s dishes. Requests accommodated (including special diets). COMMUNICATION WiFi, landline for local calls, mobile phone coverage. ENTERTAINMENT Cable TV, DVD player, CD player, Sonos sound system, iPod dock, PlayStation 4, Bose speakers. 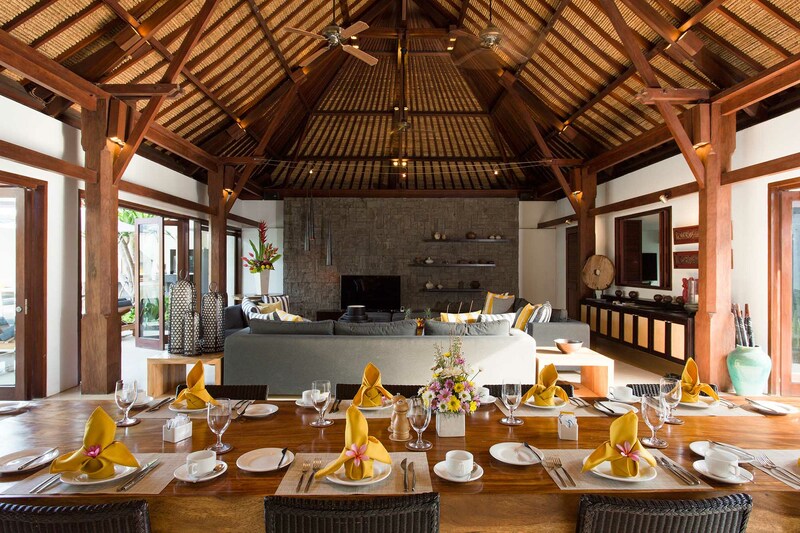 FOR FAMILIES Villa Lilibel is well equipped for families. 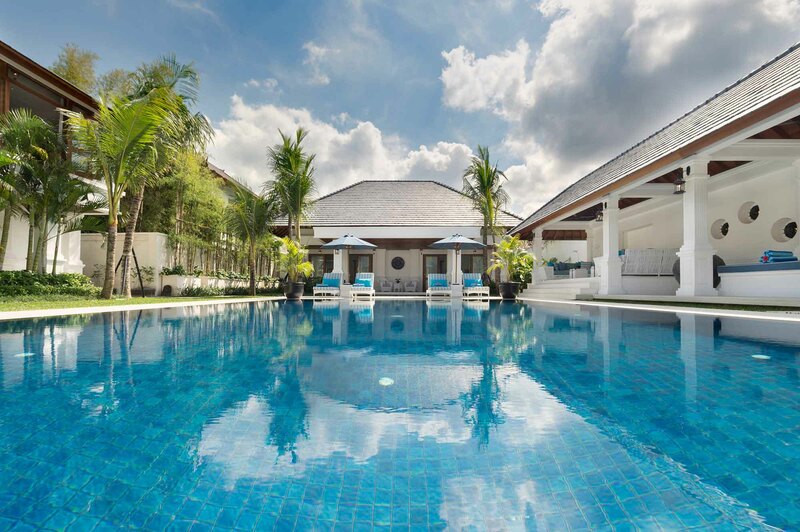 Facilities include: baby cot, high chair, pool safety fence (charge applies) and wading area at end of pool. GYM Equipped with treadmill, exercise bike, elliptical machine, dumbbells and training bench. 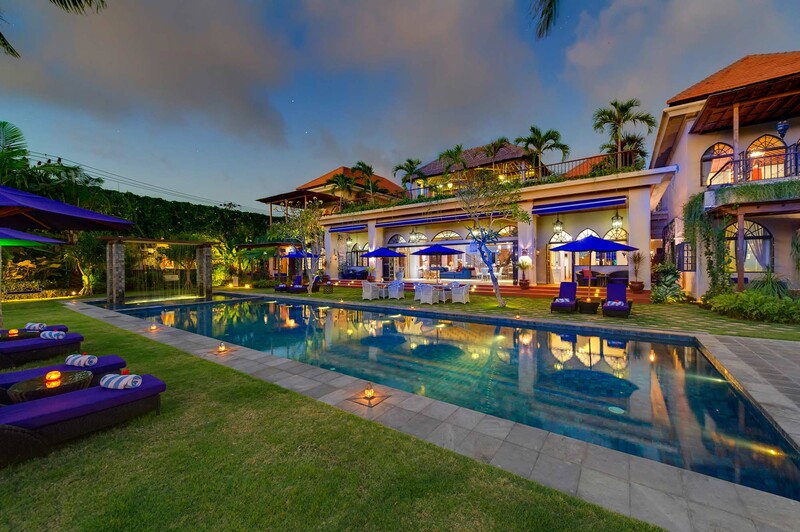 TRANSPORT Villa Lilibel’s central Seminyak location means that many attractions are within easy walking distance. If additional transport is required, don’t hesitate to ask the villa manager to call one of the island’s safe and reasonably priced metered taxis, or to organise day or half-day car and driver hire for sightseeing (additional cost). 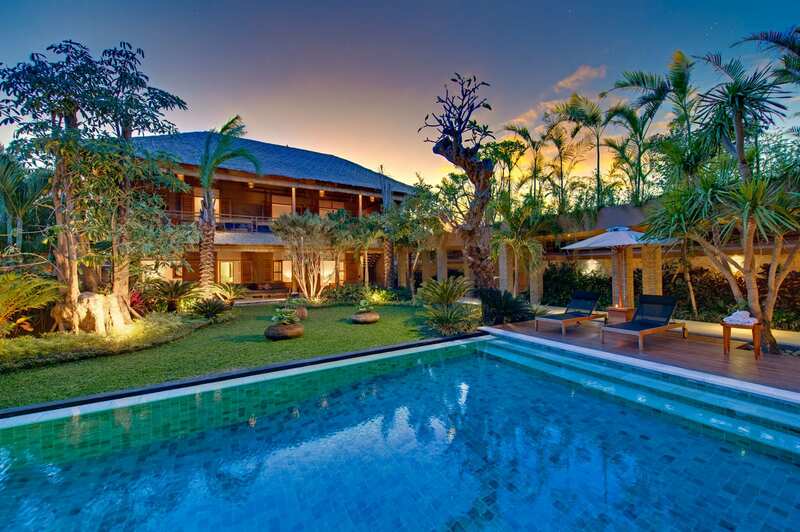 PROPERTY AREA 1000sqm (villa). 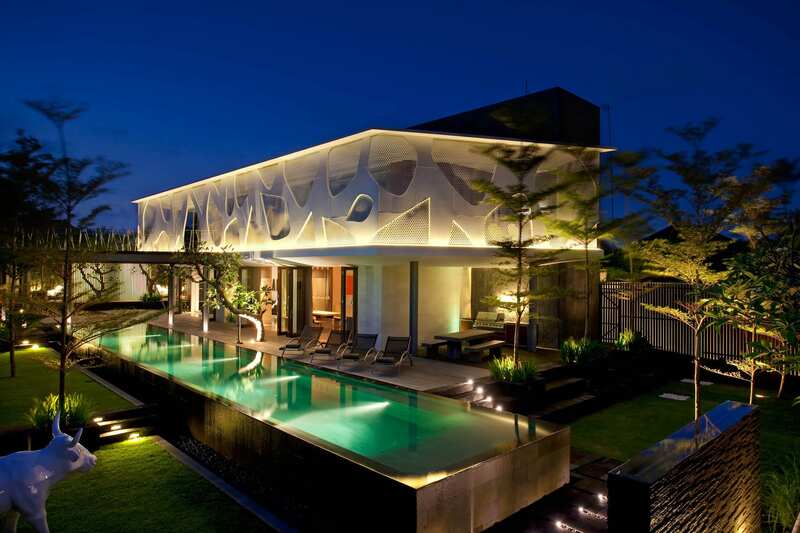 1,400sqm (land). Just returned from spending a week at Villa Lilibel to celebrate my fathers 60th birthday. From the moment we walked in all 12 of us were speechless. We felt like royalty! It is the most amazing place I have ever stayed in. All the spaces were furnished and decorated to such a high standard. The pool and outside areas were comfortable and welcoming, so much so that we never even used the two inside lounge areas. What took the stay to another level was the staff. We were so well looked after. Our breakfasts everyday were so yummy, along with the club sandwiches and hamburgers we are by the pool when we were to lazy to leave to villa! One night we organised for the staff to prepare a seafood and mixed meat BBQ dinner for us. It was better than the quality of most restaurants. The location is sensational. Can walk to the most amazing restaurants! Don't look any further!! Book Lilibel now. What can I say .... AMAZING. 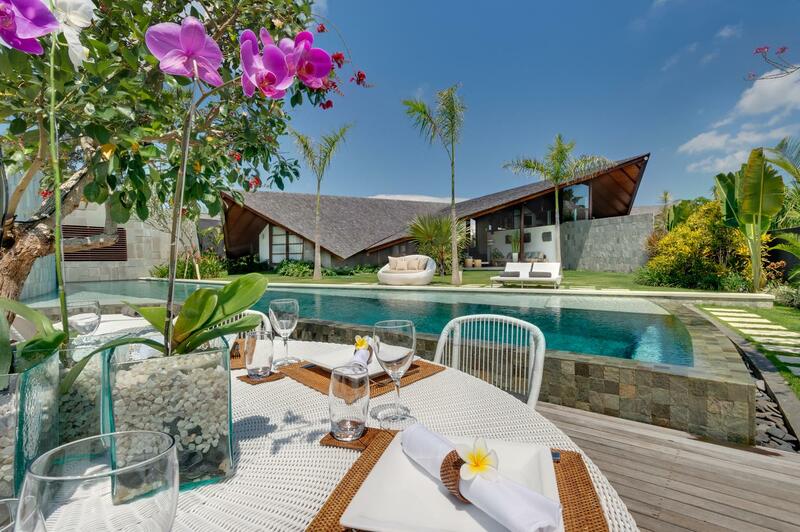 We came from another amazing Villa in Canggu, thinking Villa Lilibel would not be quite as nice, well it was 100% better. 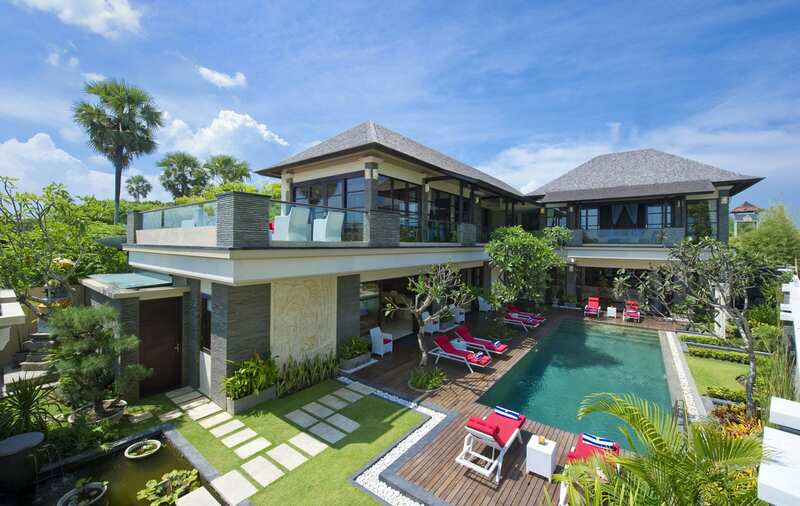 I read in another review that the pictures do not do this Villa justice and I have to agree. There was a group of 6 couples and we could not pick our mouths up of the floor from the moment we walked through the gates to the tour we were given of Villa Lilibel. 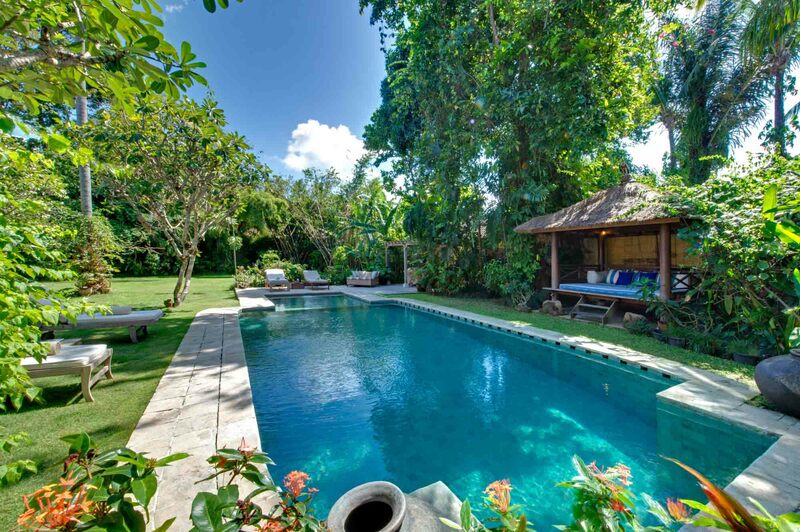 Not only was the Villa and all the 'many' rooms/areas out of this world, but the staff made our short holiday a very memorable one that all of us continually say 'how wonderful it was'. 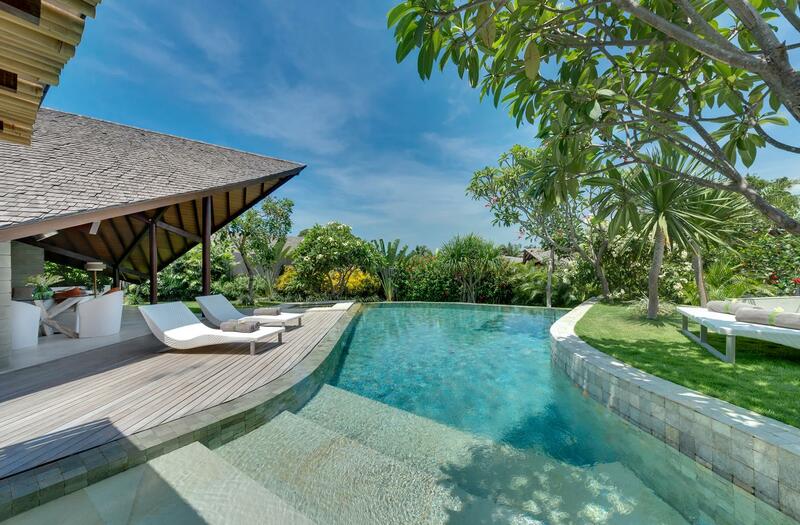 If you are looking for a STUNNING Villa with lots of SPACE in a fantastic LOCATION do not look any further. 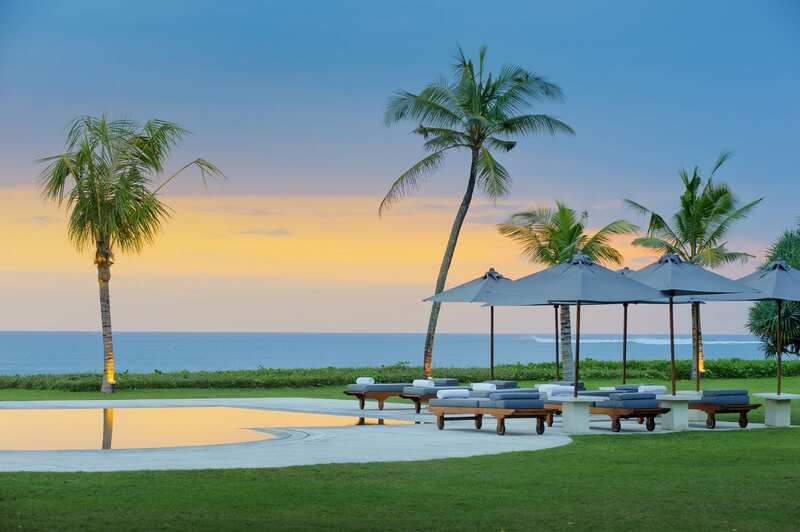 Two minutes away from the entrance of Ku De Ta, which takes you straight onto the beach. I truly cannot speak highly enough of the staff that looked after us with EVERYTHING we needed. THANK YOU THANK YOU and cannot wait until we return. 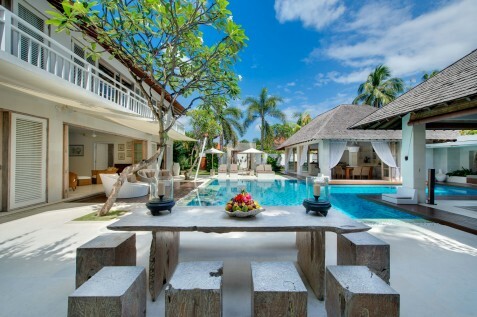 What a truly beautiful, spacious, stunning Villa. I was the lucky one to have the Master Bedroom ... well OMG it blew me away, actually blew everyone away. 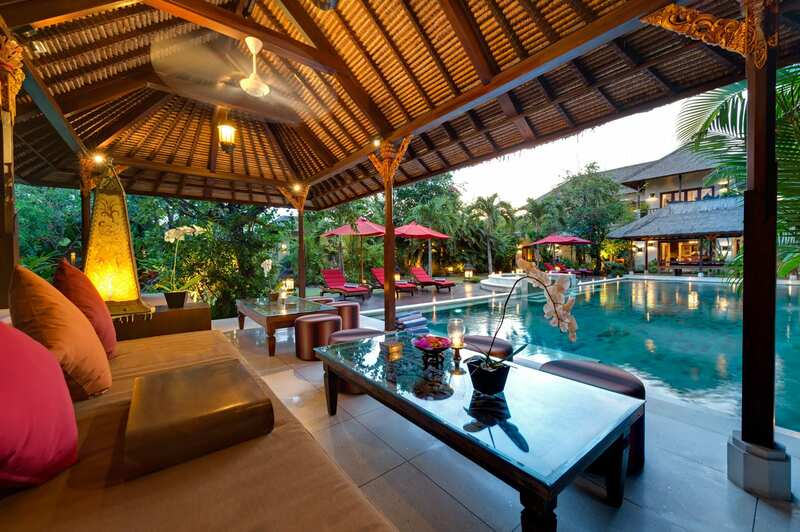 But all the other rooms were not far behind :) A group of 6 couples were lucky enough to staff in this amazing Villa. 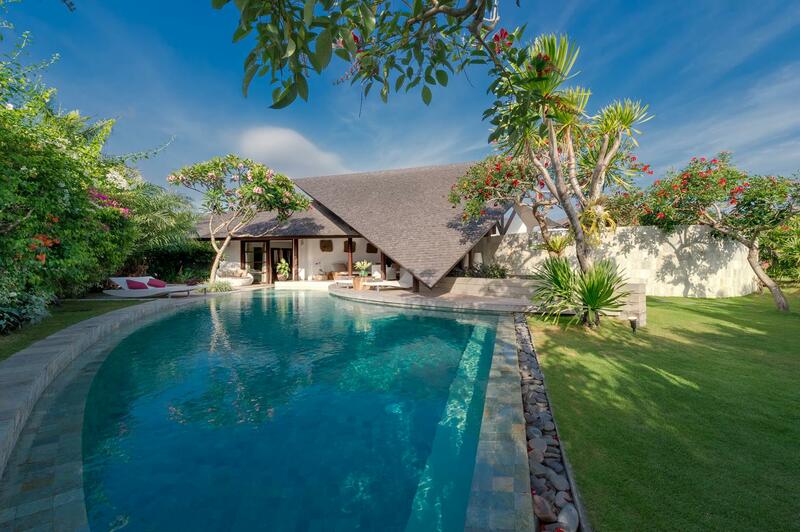 It is not only in a perfect location for Seminyak (2 mins from Ku De Ta - straight to the beach), but has many areas/rooms where you can just relax and wouldn't even know there were 12 people staying there. I cannot speak highly enough of the beautiful, most helpful staff at Villa Lilibel and just want to say a huge THANK YOU for making our short holiday very special. Until we meet again.